One of the most significant shifts in the social science curriculum happened in the subject matter of history in 2006 when NCERT introduced its new history textbooks meant to be used in all schools affiliated with CBSE from classes VI to X. The chapters, as one would be aware, do not unfold in a unilinear fashion. Rather, various epochs are not as much identified with certain ruling dynasties, but more by the economic, social, and cultural factors that shaped different epochs. For example in the Class IX textbook (India and the Contemporary World – I) there are chapters on cricket. In the class X book, there are chapters on literature and emergence of modern literature in India. Likewise in Class VIII we have a chapter on arts. Now it is not just the inclusion of these chapters that set these textbooks apart. It is the way these chapters have been conceptualized and written. For example, the chapter on cricket is not written as a simplistic narrative as to where and when the first cricket match was played, and the runs scored and wickets taken. Likewise, in art it is not just about who the painters were, and the numbers painted by them. It is rather to locate these in the wider context of Indian nationalism and British imperialism. At some level it is also to impress on us the fact that all aspects of our social existence come constantly into play and often, events and people are much more than what they appear to be. The latter perspective on history emerges out of a particular form of historiography which seeks to locate events, processes, all social, political, cultural, and economic manifestations, both past and present in some kind of a continuum. Such a historiography is yet to gain penetration in most universities and would be no surprise if teachers are bewildered about the logic and reasoning of including chapters on arts, clothing, and sports, however readable and engaging the text in itself may be. Given the routinization of teaching and the kind of compulsions teachers are forced to deal with, rarely do they have the time for the full import of these texts, their pedagogy, and content innovation to sink in. In this, the supra governing body of all government and private schools, i.e., the CBSE has proven and is proving further, how centralized decision-making bodies with their top-down approach undermine efforts to learn and teach beyond the anxiety of assessment and evaluation and in one’s time, pace and sequence. CBSE in its unease to shore up pass percentages has compounded matters of late through its ill-conceived comprehensive and continuous evaluation (CCE), which keeps teachers constantly on the leash with its demand of constant assessment. In the process of this fixation to measure learning in a centralized, undemocratic fashion, teachers are coerced with lot of data generating chore, which results in tremendous work overload and leaves them with little time to dwell on any chapters beyond the perfunctionary requirement. This indeed is a pity, for despite all the thought and effort that have gone into these books to establish the desirous effect of historical thinking as an important component of citizenship, it remains unfulfilled. Thus , due to a teacher’s own unfamiliarity with different historiographic trends and also more largely due to the myopic policies of CBSE, history, as nothing more than a political narrative, remains embedded in much of public ‘common sense’. However, in the hope that many teachers will still find the time, freedom, and motivation to adopt a more laboured but satisfying method to teach history, I seek to do two things. One, familiarize teachers with the historiographic context in which these NCERT books can be located. Two, suggest a few books and methods, which can further help teachers fruitfully engage with the textbooks and indeed go beyond them, something which these textbooks actually envision. My arguments are based on my understanding of what Joseph Schwab referred to as a discipline’s substantive and syntactic structure. The more popular and accepted perspective in history is the one about recapitulating events from the past. This can be seen as history’s substantive approach (I also call it macro approach) where individual accomplishments, battles, monuments, etc., are all to be located and understood, rather memorized, in a linear chronology. This brings an understanding of history where mastery of the subject is more or less congruent upon one’s ability to memorize the past in terms of events but less understanding or analyzing, i.e., the more of whats and whens. But this substantive understanding of history, if infused within a certain framework, i.e., Marxian or Weberian, for instance, helps to arrive at certain kind of generalizations, going beyond the political centred approach which limited the meta-narratives of an R C Mazumdar or a Nilakanta Shastri. It could also mean obtaining conceptual clarity on aspects like governance, bureaucracy, taxation, war, welfare, social stratification etc. Of course the frameworks of Marxism or ‘Weberianism’ can also be totalizing which is where the syntactic or micro-approach emerges as a helpful corrective. In the syntactic approach the emphasis is more on the reconstruction of the past based on careful reading of sources or evidences. It would then mean looking at possible epigraphic sources – land grants, inscriptions, literary accounts, and archaeological sources like monuments and coins. Students are given different types of primary records or evidences available from the cultures under study and are encouraged to interpret them with help from teachers. Given the variations that one usually sees in different kinds of evidence, children themselves are encouraged to make carefully weighted and informed decisions and arrive at certain acceptable readings or interpretations much like what professional historians do. * I would also add that under this micro approach one could include employing experiences of a child’s socialization and help a child to relate that to our past(s) i.e. how our socialization and nature of our experience plays a role in determining and interpreting our past(s) and in that sense ‘objectivity’ in interpreting the past is indeed a challenge. In my view the use of this dualistic approach where the macro-micro dialectics guide our understanding of the past also informs the new NCERT textbooks. Space constrains me from giving many elaborate examples. To understand town planning of the Harappan cultures, one can, for example, use an hypothesis where a map is made showing a town with no planning and organization, with the houses, places of worship, workshops of artisans, etc., located haphazardly. Contrast this with another map depicting a town with grid like planning, wide roads, specified location for residences, workshops, worship, etc. Now ask students which of the two maps, representing two hypothetical cultures, is better suited for trading. As one reasons the latter would evidently be it, given the neat planning which could facilitate easy movement of people and goods. 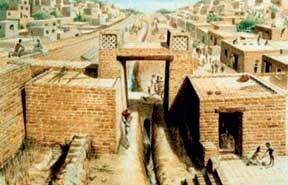 Many cities of Harappan cultures depicted similar layouts and as the textbook also states, the Harappan culture was also characterized by extensive trade networks with Mesopotamia and other cultures in west and central Asia. With this analogy the teacher can also discuss with children as to how urbanization itself is closely associated with trade even to date. Teachers can also have children look up their own localities to size up planning and drainage. The fact that a major percentage of deaths in the past were caused by poor sanitary conditions (the teacher can cite the example of Black death in 14th century Europe) in cities, the pains people in Harappan cultures took regarding drainage probably tells us something about their ability to link sanitation with epidemics and diseases. So what I have sought to condense above is an instance where macro approaches using some kind of a modelling helps a child to obtain certain kind of perspective and the micro approach (in studying their own locality/town in this context) helps in concretizing such a perspective. A book by Amman Madan and Alex George titled Teaching Social Sciences in Schools – NCERT’s new textbook initiative will also help a teacher get a deeper appreciation of the textbook and ways in which one can improvise. It is actually important for a history teacher to get a firmer understanding of the past and be generally abreast of contemporary research on Indian history to evolve meaningful pedagogies in history. Pedagogy at high school level in my view is dependent on certain understanding of content and epistemology of a discipline. For starters one can look at books by D D Kosambi’s The Culture and Civilisation of Ancient India in Historical Outline and Romila Thapar’s History of India on ancient Indian history. The Mughal State edited by Sanjay Subramanyam and Muzaffar Alam will provide select and important articles on medieval and Mughal history. And for colonial period one can look at Sekhar Bandopadhaya’s From Plassey to Partition. *Many studies of late tend to make tremendous virtue of the ‘syntactic history’ to the exclusion of substantive history approach. My contention is while such a procedure is certainly to be encouraged and despite the practical limitations that one can face in directing students to deal with such sources (for interpreting sources is no easy task and even teachers need to be trained in such tasks) without an understanding of the broader forces or the larger picture in play, history can once again slip into being as no more than a ultra-empiricist and positivist exercise. To assume as many of the syntactic practitioners of history teaching seek to have it, that the process of constructing the past alone qualifies as historical thinking, is in my view misplaced. For further reference see numerous articles related to this in Peter N Stearns, Peter Seixas and Sam Wineburg (ed) Knowing teaching & Learning History, 2000, NYUP. The author is a school teacher with more than 12 years of experience mostly teaching history. He is now pursuing research as a doctoral student at Jawaharlal Nehru University, New Delhi, exploring issues related to teacher identities and teacher mediation of textbooks. He can be reached at krishna.rs@gmail.com.